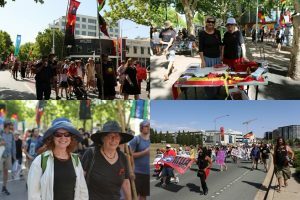 It was a huge start to the year with great community support for the the Invasion Day march from Garema Place to the Aboriginal Tent Embassy – continuing to build the momentum for change. Thanks to Rita Metzenrath for these photos. February has been a very busy month – with many more events in the next week, including a gathering for Water is Life, the 11th anniversary of the national apology to the Stolen Generations, The Sapphires at The Q, and some great First Nations performers at the National Multicultural Festival. This bulletin also covers our next meeting, current exhibitions, events coming up later, and news on issues of interest. The next ANTaR ACT will be on Monday 18 March at King O’Malley’s in Civic, 6 – 7.30pm. Note – we will usually try to meet on the second Monday of the month in 2019, but delaying this a week due to the March long weekend. All are welcome to come along to contribute to our advocacy and other activities. Any questions or suggestions, please email info@antaract.org.au. From our planning meeting, we are looking at focussing on what we can do for the International Year of Indigenous Languages, as well as continuing our advocacy on issues such as Booomanulla Oval and the Ngunnawal Bush Healing Farm, that these be controlled by and benefiting the local Aboriginal and Torres Strait Islander community. We are still looking for an assistant with this bulletin, and also people to assist with our stalls and our campaigning. So, even if you cannot make our meetings, you may be able to contribute in other ways. Please let us know. Also get in touch if you know of an event or issue that you would like to see covered in this bulletin -you can email us at info@antaract.org.au. ANTaR ACT was very pleased to see that the contributions of Prof Muriel Bamblett, Chief Executive Officer of the Victorian Aboriginal Child Care Agency, were recognised with an Order of Australia (although, noting as she did, feelings of conflict around recognition on 26 January). Prof Bamblett delivered our 2018 David Hunter Memorial Lecture. Close the Gap Day is coming up on Thursday 21 March. ‘It is more important than ever to have a strong loud voice reminding the governments of Australia that closing the life expectancy gap is a concern for all Australians.’ ANTaR National is now responsible for managing the online registrations and resources for the Campaign to support National Close the Gap Day. For more information, see here. We advertised the Creative Spirit: Healing the Land; Healing the People forum in our last newsletter – one of the attendees, Honey Nelson, provided this summary of the outcomes of this, and will keep us informed of how these plans are going, and opportunities to participate. The ‘Yarning Circles’ held at ACCC between Jan. 25 and 28, initiated by Elders and the ‘Creative Spirit’ group, were deeply engaging and successful. We listened and talked on First Nations teaching and learning, curriculum, interconnection between all people by ‘skin names’, some bush medicine learning, your allodial title from deep earth to sky where you were born, the grieving and crying of the Old Country about the destruction and sufferings of the creatures and plants, the poisoned waters, the toxic deep mining, the shattered sacred places. Many people came to the Circles, and we were much moved by our new understandings! Many of us from the Circles wish to maintain the momentum, and push forward towards a ‘black and white’ grassroots movement and gathering, to give voice to the Country – call out to concerned people and organisations across Australia, to come together on behalf of rescue of the Old Country and waters, and change our culture before it is too late for our grandchildren. These further understandings will surely expand to address the tragedies of our invasion and settlement history, and the great needs to redress injustice, deprivations, suffering, extreme losses, grief. ‘An open invitation to all people who care about our waterways and catchments to attend a traditional water healing ceremony by senior lore men led by Uncle Max Dulumunmun Harrison. We will be joined by Major ‘Moogy’ Sumner from South Australia, a Ngarrindjeri elder from the Coorong at the mouth of the Murray who will be leading a dance group…. The ACTCOSS Gulanga team are working in partnership with Dhunlung Yarra team from Relationships Australia Canberra and Region to present to the broader community ‘Stories from the Children of the Stolen Generations’. This presentation will give some insight into the effects of the intergenerational trauma experienced by the children whose parents and families have been struggling to heal from the effects of being removed as a child. The Sapphires is a funny, heart-warming tale inspired by the true story of writer Tony Brigg’s mother. It tells of the incredible journey of a singing group of four Yorta Yorta Women who sing Motown Soul hits against the backdrop of personal change and massive social upheaval. It is an energetic, fun and engaging play that affirms life and the realisation of dreams. In addition, there will be other Aboriginal and Torres Strait Islander performers appearing through out the festival with Christine Anu and Isaiah Firebrace headlining the entertainment, while celebrity chef Mark Olive will provide live cooking demonstrations. ‘An Aboriginal, an Asian and an Islander walk into a bar… It’s not the beginning of a racist joke, it’s the catalyst for a stinging satire on Australian politics from award-winning playwright Nakkiah Lui (Black is the New White). Since cutting her teeth and making a name for herself on the Australian touring circuit in the late 2000s, Mojo Ruiz de Luzuriaga, a.k.a Mojo Juju, has been many things to many people. She’s been a troubadour, a soothsayer, a shapeshifter and a darn good songwriter. Now, she has decided to just be the story. ‘Native Tongue’ is exactly that: Through the telling of family history and her own personal experiences, Juju explores her relationships with Elders and Ancestry and how that informs her own identity. Australian singer-songwriter Archie Roach emerged in the early ’90s. His ARIA-winning debut album, Charcoal Lane, was named one of Rolling Stone Magazine’s Top 50 albums of 1992. It centered around Archie’s heartbreaking song, Took the Children Away, about his own experience as one of the “Stolen Generations” of First Nations children who were often forcibly removed from their parents and communities and placed in non-indigenous institutions and homes. Archie’s music speaks the stories of his people, of this land and of the human condition. His voice – uniquely Australian and undeniably universal – continues to resonate for us all. Indigenous dance sensations and landmark dance/theatre company that took the world by storm present their internationally acclaimed smash hit production. Unique, infectious, high-energy… like a confetti cannon point blank to the heart. Djuki Mala wow audiences with a spectacular fusion of traditional dance, pop-culture and storytelling that is a marvel of timing, comedy and clowning with a hefty dose of heart and soul! Put on your virtual reality headset and let David Gulpilil and Jack Charles guide you on a journey of Aboriginal and Torres Strait Islander song and dance. You’ll encounter the contemporary dancers of Bangarra performing at the Sydney Opera House, The Lonely Boys rocking out in Alice Springs, and performers of songs and dances used to share knowledge and culture for thousands of years. From Uluru to Cairns and the Torres Strait, this is an intimate and immersive experience unlike any other.